Last night marked the end of the first season of How to Get Away with Murder on ABC. The finale had a killer twist — and there’s more to come in season two. 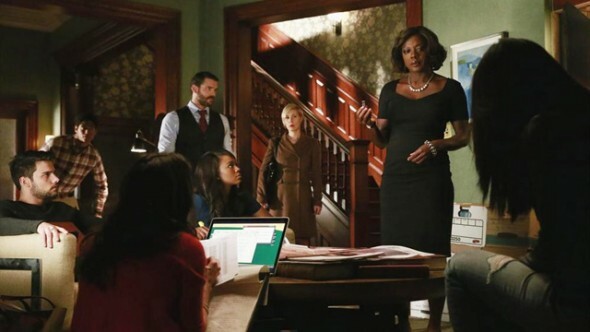 The network has not issued a renewal press release but a promo at the end of the episode (see below) stated that How to Get Away with Murder will indeed return for a second season in the fall. A legal-mystery TV series, How to Get Away with Murder revolves around a college professor and defense attorney (Viola Davis) who, along with her students, gets involved with a murder case. The rest of the cast includes Tom Verica, Billy Brown, Alfred Enoch, Aja Naomi King, Jack Falahee, Karla Souza, Matt McGorry, Charlie Weber, Liza Weil, and Katie Findlay. Though the ratings have come down quite a bit over the course of the season, it remains one of ABC’s top-rated shows and is currently averaging a 3.0 rating in the 18-49 demographic with 9.88 million viewers. SAG Award winner Davis teased the second season renewal a few weeks ago on Facebook, writing, “Just wrapped filming season one and onto SEASON 2 BABY!!!!!”. What do you think? Do you like the How to Get Away with Murder TV show? Will you be watching season two? Realistically, how long should this show run? Worse show ever, no plot, characters shallow, please a cartoon would be better. Viola Davis should win all the awards just for going without her make-up and wigs. She is very brave and beautiful. I really do enjoy this dark drama. I really enjoy this show. Thank you Shonda for another great show to watch. I watch this show on Hulu because I am unable to watch on the night it comes on. As soon as I have a free moment, I am pinned to my TV. I rewind and replay so that I do not miss anything. Can’t wait for next season…. Wes killed Rebecca …. It is a well conceived and acted storyline. Davis is a talented actress and really carries the show. The supporting cast is great also. I hate how many shows split the season up. I think many people get distracted with life and have a hard time following when it returns. I didn’t know it returned right away and had to catch up. Keep the show on and get rid of the season split. Love this show. Will definitely watch Season 2 !! My wife and I like “Murder”, better than “Scandal”. Scandal is sliding precipitously close to the proverbial edge of the cliff. I’m sure that Maria will do the same thing considering its origins. Davis is a talented actress, but this show is a mess–unlikable characters, inexplicably convoluted plots, an unrealistic setting, and a “throw everything including the kitchen sink” approach to creating suspense. The ratings declined all season, and I’m sorry that the series was renewed. Hopefully it will fail next year, and Davis can display her talent in other venues. stopped watching after 6 maybe episodes because i was so confused by the flashback scenes, tho i had been enjoying the performances…am wondering if if,s worth renting eventually…do questions get answered eventually (the core case, i mean)? Yes, the core case does. In the season finale.